How many children, INDIAN children at that, are aware that they have rights ? 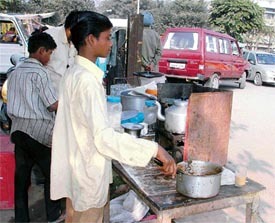 Does the under-aged boy working at that tea-stall near your office know that child labour is illegal ? Does his employer know that ? How old is the “young” looking domestic help who cleans your house and washes your dishes ? Does she go to school ? How many of us have been witnesses to incidents of child abuse and haven’t done anything about it ? You know, the young urchin who got beaten up for sitting outside a shop and “obstructing the view” of potential customers ? Or the little girl who was slapped by a pedestrian for bumping into her pristine white sari ? “These things happen”, you say. Reverse the faces on these photographs. Place yourself in the lives of these children. Life is harder for them than you would ever imagine humanly possible. Child Sexual Abuse is a regular occurence with these children [*this is to say that they belong to a high vulnerability level*]. The picture below is self-explanatory. How many rights do the children in the picture below have ? The pictures represent the truth. A truth that needs to be changed. Please leave a comment if you are aware of any incident that is related to child abuse.Thank you. This situation is a sad one. My heart breaks at the reality that is the lives of many a child. The pain, suffering and abuse must end. As a people, we cannot afford to look the other way. Thank you, honestly, for raising awareness through this post. I will send people here to raise awareness further. Thank you very much madam.We all need to fight against it unitedly to help those kids.Kids are the future of any country or any nation & it’s our duty to help them grow as they should.